With Supermarkets continuously driving down prices, despite rising inflation, food production is perhaps one of the most ultra-competitive industries in Europe today. As this pressure intensifies food processors and manufacturers are continuously looking for ways in which cost savings can be made. One area which may offer significant savings is the maintenance and servicing of production machinery; in particular the substantial downtime involved in removing and fitting rolling bearings which have failed, or require servicing. The continuous production pressures in food processing mean that the emphasis has to be on using production equipment that is relatively quick and easy to return to service in the event of a failure. As maintenance professionals know this is much easier said than done, especially with equipment such as large air movement & extraction fans, conveyors, elevators, mills and line shafts which often use solid bearings as the components of choice. 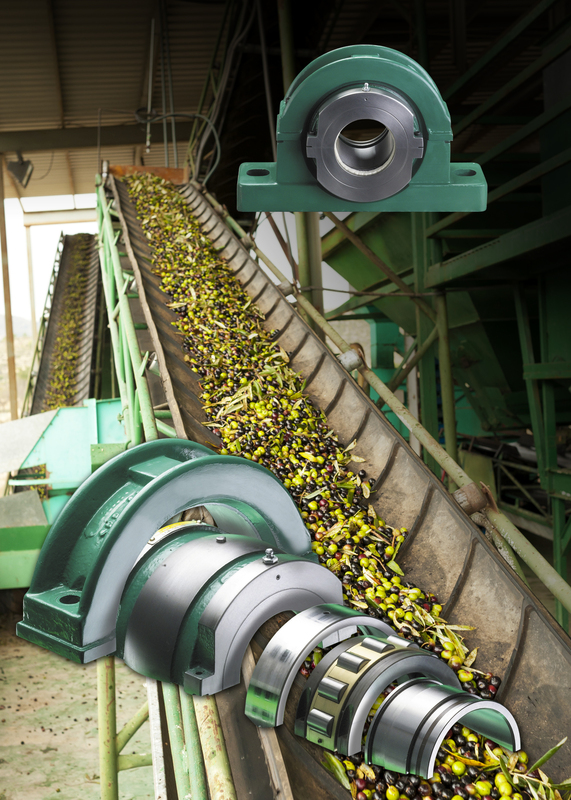 Solid bearings comprise the major segment of rolling bearings in use in food processing today; yet they are difficult to fit, impossible to inspect whilst in place and time consuming to replace when they fail. However, because they are relatively inexpensive, no one stops to ask whether they provide the best solution in all applications. The truth is that often the initial cost saving becomes redundant during the bearing’s service life when compared to a split roller bearing; the latter taking just 10 percent of the typical time taken to install a conventional solid bearing. As well as speedy installation, split roller bearings also offer the unique benefit of allowing for full bearing inspection in situ, as well as the fast and simple changing of the complete bearing & housing when problems are encountered. Split roller bearings are totally split to the shaft, a design that simplifies installation and cuts downtime to a fraction of that traditionally expected of their solid counterparts. In addition, Revolvo SRB split roller bearings have a longer life span because they provide superior sealing arrangements. The sealing advantages are intrinsic to the SRB split roller bearing’s design, where the spherical location between the housing and support pedestal ensures that under conditions of shaft misalignment, and irrespective of what type of seal is used, the seal will always remain concentric to the shaft. As a result, SRB split roller bearings perform exceptionally well in harsh operating conditions, even with shaft misalignment. In contrast, solid mounted roller bearings can suffer from non-concentric ineffective seals which will rapidly lead to expensive premature bearing failure. A further advantage of Revolvo’s SRB split bearing design is that it allows the shaft to be supported by the lower section of the bearing; while the upper sections of the housing & bearing outer raceway can be removed, making it easy to inspect & service without lifting or removing the shaft. This feature is extremely valuable, especially regarding large machines, such as mills & elevators, or long line shafts, where sheer weight and size is a barrier to fast and effective servicing. It also allows for faster bearing replacement, which can save continuous-type businesses a lot of money in costly downtime. In an industry that is as competitive as food production it is vital that operators can keep their costs down so they can remain competitive. Revolvo SRB bearings not only cut the total cost of the bearing during its total life cycle, they also cut downtime by up to 90 percent in the event of bearing replacement compared to that traditionally expected with conventional bearings; maximising the customers return on their assets employed.